OAKLAND, CA - A new report, released Tuesday, June 23 by environmental, occupational safety, and community benefits experts, in collaboration with researchers at the University of Illinois School of Public Health, finds that recycling work is unnecessarily hazardous to workers’ health and safety. Seventeen American recycling workers died on the job from 2011 to 2013, including at least three in California. Recycling workers are more than twice as likely to be injured at work as the average worker. Improving conditions in the recycling industry is critical for workers in California, a state in which there are 163 Materials Recovery Facilities (MRFs). Significant progress has already been made in the East Bay to improve safety through innovative training that has helped hundreds of recycling workers to learn to identify hazards, know their rights, and take corrective action. 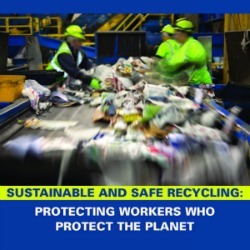 The report, Safe & Sustainable Recycling: Protecting Workers who Protect the Planet, is released by GAIA, Partnership for Working Families, and National Council for Occupational Safety and Health (National COSH). By ensuring health and safety compliance across the industry, the report’s authors say cities can create good and safe recycling jobs, and they offer concrete policy recommendations for cities to enact. The industry’s high injury and fatality rates are a result of unsafe working conditions around heavy machinery and exposure to hazardous items on the sort line, like hypodermic needles, toxic chemicals, and animal carcasses. Many waste and recycling companies rely heavily on temporary workers, who have fewer protections and are less likely to be informed of their legal right to a safe and healthy workplace. “This report confirms what we know about similar facilities in the Bay Area through our participation in the Campaign for Sustainable Recycling, led by ILWU Local 6. It is critical that our local governments only sign contracts with those waste recycling companies which have effective health and safety programs in place to protect workers,” said Gail Bateson, Executive Director of Worksafe, an Oakland-based affiliate of the National Council for Occupational Safety and Health. Cities enact strong community education programs for greater household separation of waste to minimize dangerous contaminants entering the recycling stream. “Training workers about hazards and their rights is critical to making these jobs safer. We’ve learned about numerous instances where workers stopped the line because they spotted syringes, asbestos, or other serious hazards. We also know some of the root causes that contribute to the risk of injury are the speed of the line and the amount of materials they have to process. They tell us that the training we provided gave them the confidence to take action,” said Suzanne Teran, with UC Berkeley’s Labor Occupational Health Program (LOHP). The report notes that unionized workers, with negotiated contracts, enjoy more effective enforcement of legally mandated health and safety protections and also have the ability to bargain for additional safeguards to improve working conditions. The report also notes the economic and climate benefits from expanding recycling nationally, including climate benefits equivalent to shutting down one-fifth of U.S. coal power plants and sustaining a total of 2.3 million jobs. That is more than 10 times the number of jobs that would exist if we sent the same material to garbage incinerators and landfills. “If we are serious about solving the world’s ecological crises, we need to invest in protecting the lives and livelihoods of workers whose daily efforts are reducing pollution, conserving precious resources, and mitigating climate change,” said Monica Wilson of GAIA, a contributor to the report. Partnership for Working Families is a national network of leading regional advocacy organizations. Together we are a voice for working families, promoting policies that create quality jobs and thriving, healthy communities. National Council for Occupational Safety and Health (National COSH) links the efforts of local worker health and safety coalitions in communities across the United States, including Oakland-based Worksafe, advocating for elimination of preventable hazards in the workplace. Authors include experts including at the University of Illinois, Chicago Hospital and Health Sciences System and Massachusetts Coalition for Occupational Safety and Health (MassCOSH). Worksafe, ILWU Local 6, the Labor Occupational Health Program at UC Berkeley, and others are engaged in a coalition effort to improve working conditions in the waste recycling industry in the San Francisco Bay Area. Click here to download the full "Safe & Sustainable Recycling" report (PDF).